Ousted South Korean President Park Geun-hye is expected to be released by prosecutors after a 14-hour interrogation over a corruption scandal that brought her down. Ms Park denied all charges on Tuesday, Yonhap news agency reported, citing sources. She could be charged for allegedly allowing close friend Choi Soon-sil to extort money from large firms. Ms Choi has been charged with bribery and corruption. After arriving at the office, she told reporters she was "sorry to the people," adding: "I will faithfully co-operate with questioning." Ms Park did not exercise her right to remain silent during the marathon questioning session, which lasted late into the night, officials said. She will leave the prosecutors' office after checking the records of her statements for accuracy, according to her lawyer. When asked if an arrest warrant was likely to be issued for Ms Park, prosecutors said they were "concentrating on the interrogation", local media report. 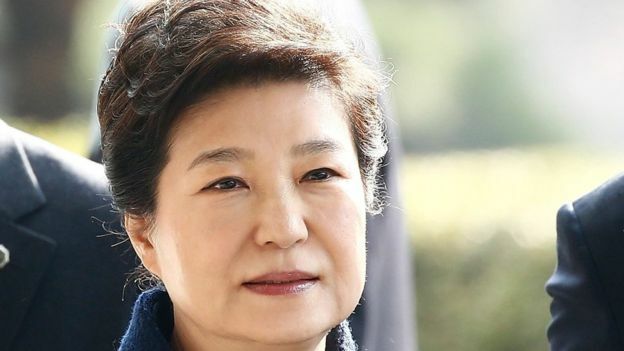 Ms Park resisted efforts to question her when she was president, but lost her immunity when judges upheld parliament's decision to impeach her. One of her lawyers said a doctor was doing check-ups during breaks "as her health isn't looking well". On Tuesday morning, Ms Park's supporters gathered outside her home in an affluent suburb of Seoul, as she was escorted by police to the prosecutors' office in a short journey covered live on television. Ms Park is the first democratically elected leader to be ousted in South Korea. Thousands of people celebrated in Seoul after her removal from office on 10 March. However, there were also angry protests by her supporters outside the Constitutional Court. The court ruling was the culmination of months of political turmoil and public protest. An election will now be held by 9 May. Hwang Kyo-ahn, who is loyal to Ms Park, is currently the acting president. On 10 March, the Constitutional Court ruled that Ms Park's actions "seriously impaired the spirit of... democracy and the rule of law".